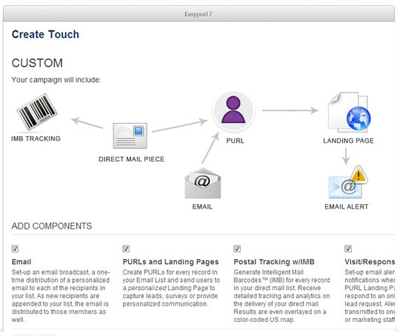 EasyPurl: Create Personalized URLs and Customized Landing Pages for Direct Mail. Powerful features deserve in-depth explanations. Click on each category for in-depth information about our solutions. These days, it seems like there are as many different ways to send massive amounts of emails as there are people to send them to. At Easypurl.com, we know that sending out a million emails isn't the real challenge, it's making those emails connect with your audience that really counts. Imagine sending email that is fully integrated with all of your customer and prospect data that you've painstakingly gathered for direct marketing purposes. Imagine sharing it seamlessly between your email campaigns, direct mail, landing pages and even contacts within your CRM without ever having to import or export data between marketing applications again. You don't have to use your imagination anymore, because it's here with the Easypurl.com cross-media marketing platform. Now you can run and manage multiple campaigns in real time, analyze and refine them all from a single, centralized database. 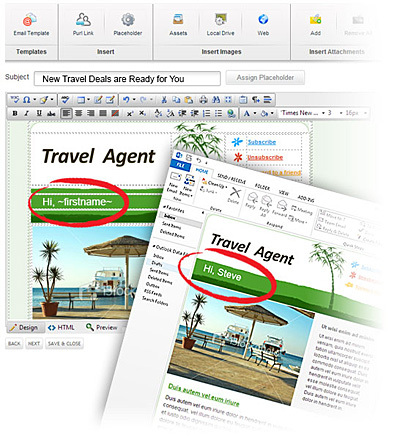 You can even share assets such as images and documents across your entire campaign. Automating your follow-up is easy when all the touch points of your campaign are connected. Trigger personalized email based on a prospect's visit to your website or send a delivery confirmation of your postal direct mail to them. Better yet, it's easy to view big picture reports and Key Performance Indicators (KPIs) that provide visibility into all aspects of your campaign with no need to consolidate data. 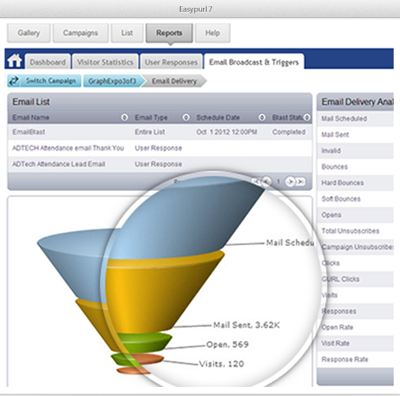 With EasyPurl.com's powerful reporting dashboard, a single integrated view of your entire campaign is just a few mouse clicks away. Take email personalization to another level by creating a truly personal dialogue with your customers and prospects. Design personalized, attractive and engaging email messages that drive results. Dynamically personalize the content of messages, including text and graphics for each recipient, plus leverage your database to customize messages by list segment or prospect profile. As with all direct marketing, delivery matters. 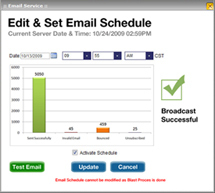 Easypurl.com mail servers are white-listed with major ISPs so you enjoy better delivery and response rates. What's more, built-in safeguards make it easy to be 100% CAN-SPAM compliant to ensure that your marketing communications are distributed in a considerate and legal way. Whether you're sending a simple "thank you" response or presenting your prospects with a tailored follow-up marketing message, Easypurl.com makes it simple to set up multi-touch marketing programs that can run literally while you sleep. For instance, drive conversions by triggering emails based on postal delivery notifications, visits to your Personalized landing pages, or even actions taken by prospects or customers on your website. 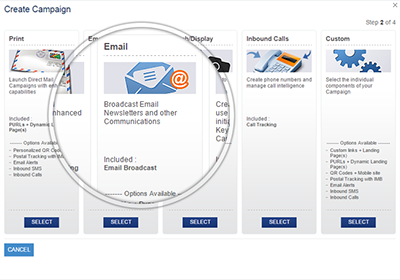 Tracking your Direct mail campaigns just got easier with Intelligent Mail Barcodes. Now Easypurl.com can deliver that data alongside the results of your campaigns – and can leverage real-time delivery information to help increase web-response rates. So now all your Direct Mail campaigns, whether First Class or Standard Bulk Business Rate, will have 'first class' data and reporting thanks to Easypurl.com. Get your message out everywhere, with a single solution. With all the necessary tools to orchestrate integrated, cross-media campaigns, our platform allows you to communicate with Targets using consistent, complementary messaging across email, web, mobile, social media, print, and more. Our platform makes it easy for you to send highly personalized Direct Mail communications to your Targets – with the same customization and personalization technology we have available on Landing Pages and Emails. Leverage your database to create effective messages – then use our tracking and analytics to gauge effectiveness. Use our new Print templates to create compelling offers that drive offline traffic to Personalized URLs, QR codes – helping you create personalized cross-channel engagement. Our Platform is a full self-service solution for marketing programs aimed across channels – but Email remains one of the most reliable ways to stay in touch with your Targets and engage them regularly. Featuring a robust, best-in-class delivery system and permission-based rules, our email marketing capabilities ensure your marketing programs will help foster strong, lifetime relationships. With hundreds of ready-made, customizable Email templates available at no extra charge, you will never be short on ideas. 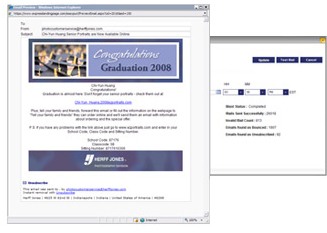 And, with our powerful WYSIWYG Email Designer, you can compose an eye-popping email in minutes…so you probably won’t be short on time, either. Leverage what you know about your Targets to create customized, personalized messaging that vary depending on who is seeing it. With powerful campaign management tools and real-time analytics that track delivery, opens, clicks and more, you will always have a handle on how your campaign is doing. Reach Targets through their mobile handsets and tablets while they are on-the-go with Dynamic Mobile Landing pages, QR Codes, SMS messages, and more – and then adapt and refine your messaging as you accumulate results. Leverage the same powerful WYSIWYG tools available for Landing Pages to create stunning, personalized Mobile Landing Pages and optimized emails. We have performed all of the platform-specific modifications, so you don’t have to. Create your assets once, and instantly reach a variety of mobile devices and platforms. 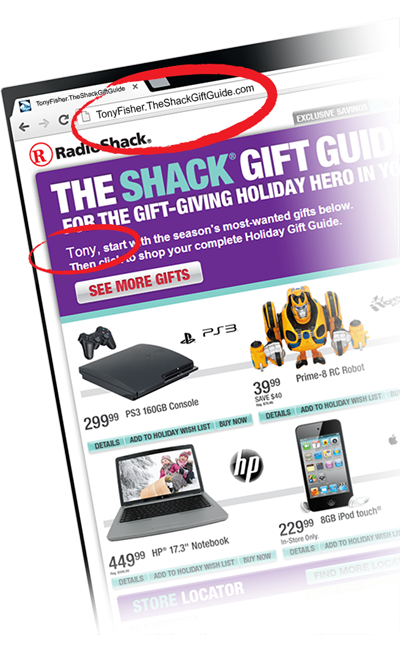 See how Targets interact with your mobile Campaigns with detailed analytics and reporting. See what mobile site elements they are engaging with, how they are interacting with it, to help determine what’s working and what’s not. Work Social Media into your marketing mix and reach not only your Targets – but potentially their friends on Facebook and followers on Twitter as well. Track the performance of your social campaigns and track referral awards as you leverage the power of the marketing world’s most fascinating new channel. Reach your Targets through social media channels with sharable personalized content. 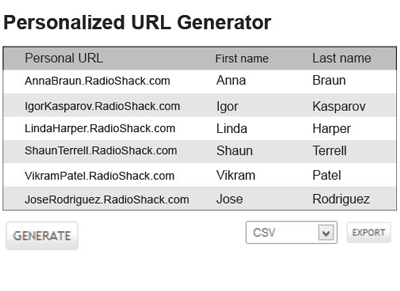 That when activated that when shared, is personalized for anyone in that Target’s social graph. See which Targets are referring their Friends and Followers — and who those Friends and Followers are. 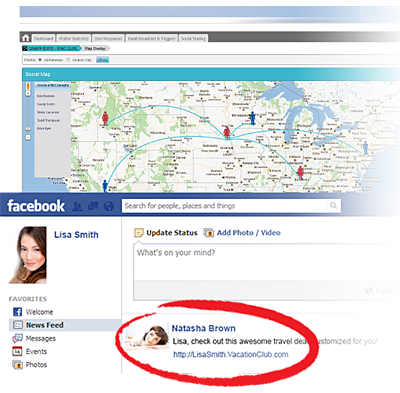 Track both to recognize referrals and see how effectively your social campaigns generate customer relationships. Segment your Targets based on their interaction with your social campaigns and single out your influencers for referral awards or other marketing programs. With our unique personalization engine, marketers can finally deliver unique, relevant experiences for each Target on a one-to-one basis. Create compelling, highly personalized messaging to foster brand loyalty and drive campaign revenue - with point-and-click ease. A Personalized URL is a unique and personalized Web address created especially for each Target customer or prospect who receives your marketing communication. Personalized URLs contain the recipient’s name inside a Web address reserved exclusively for them — creating a truly personal and engaging experience. Think of it as a concierge service for your prospects or customers. Generate PURLs for Targets on your Company domain – creating a web page reserved exclusively for them, where they can receive personalized communication that maintains your brand experience. Generate hundreds of thousands of PURLs whenever you need to – in seconds, and from anywhere. Optionally include security codes for any PURL to protect any personally identifiable or private information. Host your PURLs using our exclusive technology on a domain name that is meaningful to you. All you need to do is own the domain – and we will host your PURLs and take care of the rest. A QR ("Quick Response") code, when scanned by a phone, can open a web link, dial a phone number, view a map location, download an application, and more. With our personalization technology, you can use QR codes to engage your Targets with unique and personal offers – no matter the device. Each Target in your database can receive personalized QR codes that are unique to them, and drives them towards the right message. 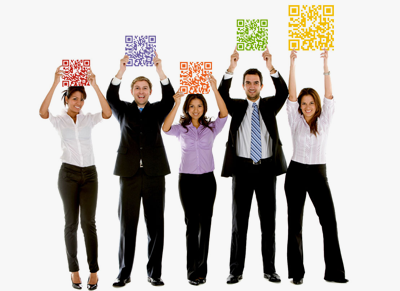 Generate QR codes of any size to include in any of your campaigns – in seconds, and from anywhere. No need to enter in complex URLs on a tiny smartphone screen. 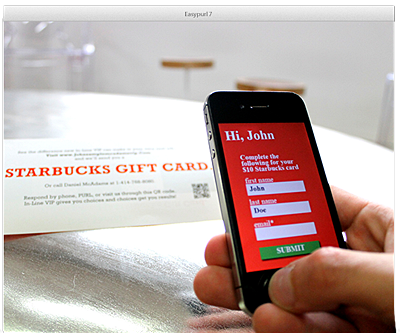 With variable QR codes, Targets are just a Snap away from engaging with your marketing program. Our unique technology creates QR Codes using a proprietary, lightweight font – allowing you to incorporate Mobile in your campaigns without the need to deal with large image files. Nurture long-term relationships with a unique, permanent home on the web for each Target. For the first time, marketers can reach large audiences with unprecedented customization –establishing personal connections to their messaging by acknowledging each Target’s individuality. Under the hood of our platform lies the world’s most powerful Personalization engine – which allows you to tailor communication to each individual target – enabling unprecedented 1:1 personalized engagement. Tailor your messaging based on Targets’ profile information, known interests and affiliations, and online activity. Deliver variable text, images, and rich media elements – which can all change dynamically based on Targets’ recent activities or changing profile information. 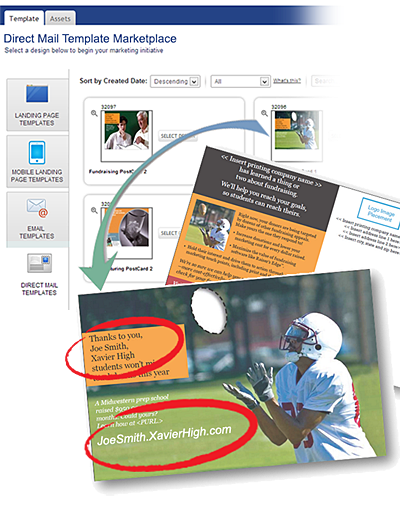 With out-of-the-box support for variable print, web, email, mobile and social messaging, you can be rest assured that your customized message will get noticed, no matter the channel. Choose how to personalize content with our visual “Mapping” interface, which enables users to start delivering powerful personalization across channels using simple “if-then” logic – no technical knowledge necessary. Personalized, or Dynamic Landing Pages enables you to engage each of your Targets on the individual level with the message that’s right for them — with laser-beam precision. And, anyone can do it. Our tools let you simply and easily craft powerful, customized pages that you can easily test and optimize. If you can drag and you can drop, you can create stunning landing pages and email communications in minutes. Our simple yet powerful WYSIWYG Landing Page Editor lets you create pages without knowledge of HTML, CSS – and, there is no complicated software to install. With hundreds of ready-made, customizable templates for desktop web, mobile and print available at no extra charge, you will never be short on ideas. Get the most from your campaigns with lead-capture forms and build multi-paged customized surveys. Make your Landing Pages come alive with rich-media widgets that can display custom variable content such as video, interactive flash, maps, news and social feeds, and more. With our platform’s built-in A/B "Split" Testing, determining which versions of your campaigns are most effective has never been easier. Take the gut-feelings and guesswork out of your decision-making – and replace it with data derived from real, user interactions. Use the data you have on customers and prospects to optimize marketing efficiency. Precisely segment groups of Targets – then leverage powerful trigger–based marketing automation to reach them with relevant messaging, at the right place, at the right time. Our platform offers a powerful and robust repository where Targets are stored, tracked and managed. Store profile information about customers and prospects – as well as collect and measure their activity across your campaigns – and intelligently segment Targets accordingly to send them the right message, on any channel, at the right time. Segment Targets based on their profile data, known affiliations or interests and online activity and interactions with our powerful "List Builder" tool. Choose any combination of elements to extract the right audience for your marketing messages. As you learn more about your customers, your segments can grow. Dynamically filter your targets across multiple dimensions to automatically enter qualifying Targets into relevant marketing programs. Choose a segment for your marketing program – and then further customize your messaging as you vary your communications based on the Targets who are viewing it…ensuring that the right language and offers reach the right audience. Guide the conversation with your customers with easy and powerful marketing automation features that make nurturing your leads through the sales cycle a breeze. Segment your Targets and customize the content and timing of your outbound marketing messages in response to inbound actions and online behaviors. Determine the next step of a marketing program – or create a special offer – based on Target profile data, form submissions, or other interaction events with point–and–click ease. Schedule emails, social media messages, SMS, or other communications based on new activity, or Profile field updates. Every customer will feel like they are getting the right message at just the right time. With a single, centralized database, our Platform allows you to track and manage your leads from generation through conversion into life–long customers. Store profile information about customers and prospects – as well as collect and measure their activity across your campaigns – and then leverage it across channels to drive marketing efficiency. 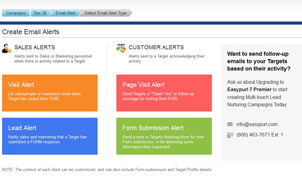 Track every interaction, page view, form response and more for each Target. Route and re–distribute leads, score activity, or prioritize follow–up with our powerful Lead Management utility. Help Sales and Marketing prioritize their pipeline with our Lead Scoring features. Place values on profile information and user activity in our platform – and get visibility over when "qualified" leads are ready to engage in a purchase conversation. Have your own CRM that you use? No problem! 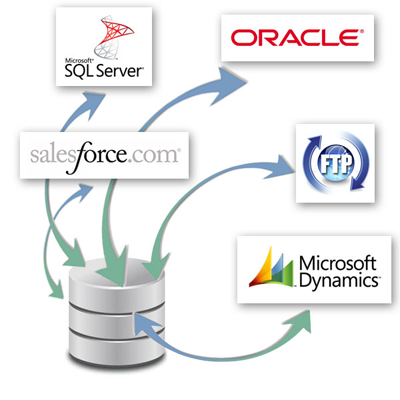 With our powerful out–of–the–box support for Salesforce, Microsoft Dynamics, and others – and our available API – we can send information to and from just about any database. With bi–directional communication with your CRM platform, you can pull profile information into our platform – and push information about Target activity back out. By sending inbound and online user activity to your CRM system, you get a complete perspective of how your leads and contacts are engaging with your marketing programs. Have our platform in mind for a custom solution that you are developing? Seamlessly integrate third-party applications and unlock more functionality from our platform using our available API integration toolkit. Our platform features built-in analytics on every PURL landing page, QR code, email, SMS, mail piece, call, and more that is managed through our system. With Easypurl, you get unprecedented visibility over total campaign performance -- down to the level of each individual target – making campaign measurement and optimization easier than ever before. Get total visibility over your marketing efforts with an innovative Reports dashboard that displays campaign performance across all channels. See who has been interacting with your messaging, and how – from a single, intuitive online interface. Marketing programs on our platform reach across channels – and so do our analytics. See performance across print, email, social, and desktop web channels – allowing you to track the performance your marketing efforts, both online and offline. 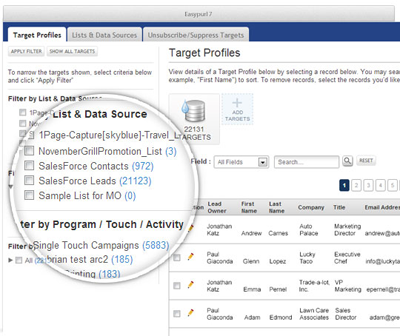 View activity and events for your entire campaign – down to the individual Target level. Your performance analysis can get as granular as you’d like. Stay in touch with your marketing programs no matter where you find yourself. With our Reports available on iPad and Android tablet devices, you are never far from your metrics. Send emails based on actions taken on your PURL campaigns with personalized, triggered messaging to respondents – as well as alerts your client’s marketing and sales staff. No matter who responds – or doesn’t respond – Easypurl can send messaging accordingly. 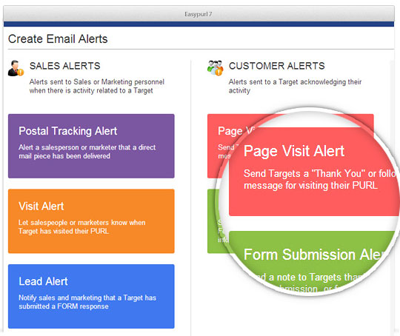 Notify sales or marketing staff in real time, via SMS or email, every time a recipient takes action on a PURL campaign. Whether they respond to their PURL page, respond via SMS, reply through our BRC service, or call in via telephone – we will notify you in real-time of their activity. Send variable follow-up messaging to respondents based on the actions they took on your campaign. Did they fill out a form? Send them a confirmation email. You can even vary messaging based on individual responses or information that you may already may have. Did a respondent take no action? You can even send follow-up messaging to those who have not responded to encourage eventual conversion – say, by sending ever-greater incentives over time. When you login to Easypurl’s Reports Dashboard, all of your marketing results are placed at your fingertips with the world’s easiest, most intuitive Reports Dashboard. Plus, our Reports go to work as soon as your campaign is launched -- and requires no user intervention to operate or maintain. Easypurl makes it easy to accumulate and disseminate marketing results with an interface that shows your results in an easy-to-consume graphical interface. Inside Easypurl’s Reports dashboard, all of your results are your fingertips – and easy to find, as well. You can click any graph or result to call up a table-style report that can be searched, sorted, filtered and more. Want to see who clicked on your email? How about everyone who visited your PURL? Or everyone who didn’t visit? With Easypurl, you can isolate any element or segment of your campaign and with one click, export it into CSV of Excel for offline manipulation. For agencies, printers and other Easypurl Resellers, we optionally allow you to white-label your Reports dashboard with your Company’s own brand identity. 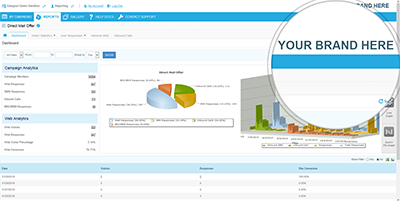 With Easypurl, your Reports interface will look as if it is your own proprietary technology! Every screen on the Easypurl reports dashboard shows your logo – and only your logo. We present your phone number and email address as the contact points for your clients when they need support. Give each of your clients a private-labelled area just for them – where they will be able to see only the campaigns that you have launched on their behalf, that you want them to see. Easily add and remove client “Reports-only” users in a simple administrative interface. We even send them automatic invitations with their log-in information that is branded with your identity. Get started with the leading personalized marketing solution for Marketers!